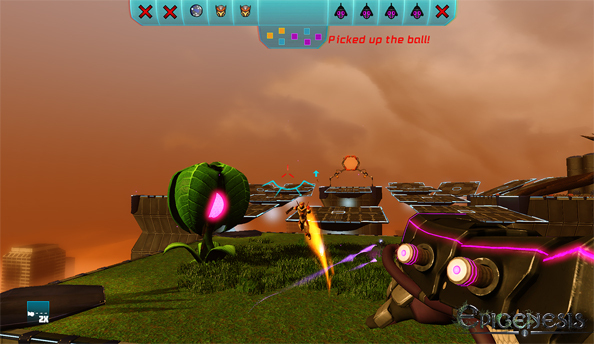 Epigenesis is a future ballsport made by disciples of Quake III and Unreal Tournament. It’s one of four prototype games designed to win Make Something Unreal – Epic Games’ annual UDK challenge in which hundreds of teams of European students compete for a commercial Unreal Engine 4 license. Four teams remain, and must iterate furiously on their genetics-themed prototypes in the runup to their final judging this Sunday. All aim to wear the code-crown previously donned by the nascent teams of Tripwire and Coffee Stain Studios, and we’ll be at Gadget Show Live all this week to capture their last steps for posterity. When I sit down to play Epigenesis, the first thing I think is: Cor! Floodlights! The first thing I feel, though, is the blood of ancient multiplayer shooters running betwixt my fingers. If Dustforce follow-up Spire has stuffed Breakneck Speed into its basket at the Quake III Closing Down Sale, Dead Shark Triplepunch are already at the tills with Floaty Jumping and Uncompromising Precision. 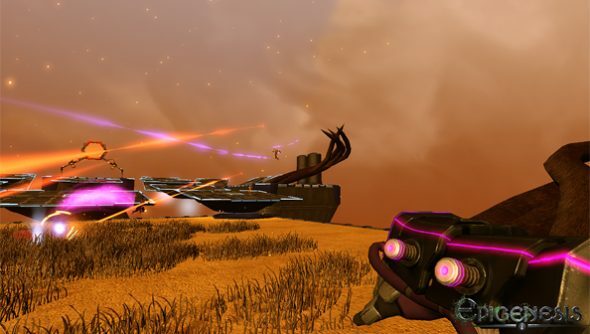 Epigenesis is no minimalist murder-sim, though. It’s an abstract ballsport, played out across platforms suspended in an implied stadium. A ball drops onto the middle platform, and two teams of five compete to punt it into their opponents’ goal. That’s the idea, anyway. More often than not they’re utilising their compressed-air attack to knock other players off their feet and into the nothing that awaits below, or plummeting there themselves after a missed jump. Of the four games I’ve played today, it’s by far the easiest to imagine carving out a steady Steam niche for itself alongside the likes of Killing Floor and Sanctum (both made by former MSU winners, incidentally). And I don’t even have to squint to see it: the Swedish team have already built a robust alternative shooter, bold in its neon-simplicity and every bit as deep as its falls. It’s not quite there yet. The team acknowledge that accessibility has been their biggest headache, and my first game is spent mostly beneath the platforms I’m supposed to be frequenting. Jumping is charged up via a held spacebar, which takes some getting used to. What’s more, it’ll likely take several matches more to get my head around the game’s one concession to genetics – a score system that sees winning players plant seeds on the platforms along the way to their opponents’ goal. I think. I’ll work it out. It’s brilliant, though. Whether or not Epigenesis wins come the weekend, expect to see its tag used again on PCGamesN.